Will the Warriors keep Durant, Thompson next summer? Summer Forecast: Where will KD, Kawhi, Kyrie play in 2019-20? This summer, we saw LeBron James leave for the Lakers, Kawhi Leonard and DeMar DeRozan trade places, and DeMarcus Cousins join the champion Warriors. Next summer? We could see even more NBA stars on the move. • Where will KD, Kawhi, Kyrie play in 2019-20? 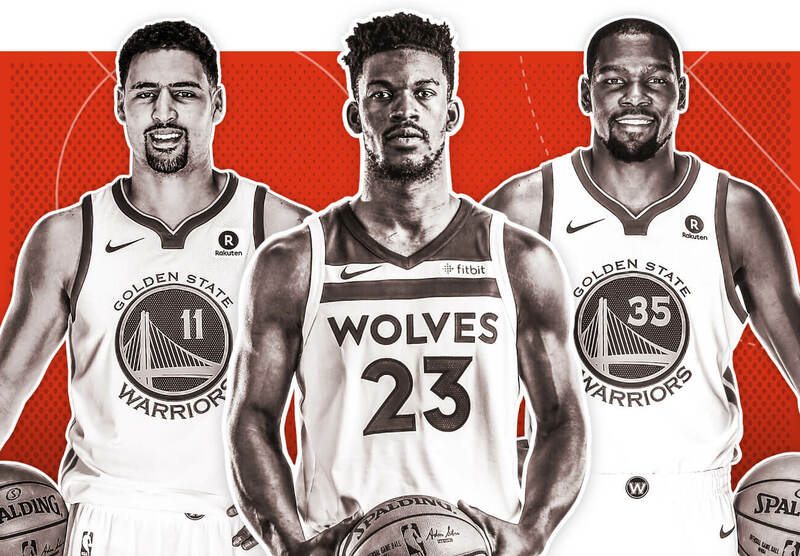 Kevin Durant, Kyrie Irving, Klay Thompson, Jimmy Butler and Leonard headline a star-studded 2019 free-agent class that can hit the market when more teams will have cap space. Where could they land next summer? We asked our ESPN Forecast panel to predict where the top five free agents will start the 2019-20 season. Where will Kyrie Irving start the 2019-20 season? Where will Jimmy Butler start the 2019-20 season? As with Irving, our panel sees New York as Butler's most likely destination, though it's difficult to see at this moment how the Knicks would create the cap space for both of them (not to mention the chance Durant chooses New York too). Perhaps most telling about these results though is the fact that 10 possible Butler destinations were listed, in addition to his current team. Where will Kawhi Leonard start the 2019-20 season? The Lakers weren't able to swing a trade for the former Finals MVP this summer, but the majority of our panel still thinks Leonard will be wearing purple and gold in 2019-20. Leonard has reportedly stated his preference for playing in Los Angeles, making James' new squad the front-runners for when Leonard becomes a free agent next summer. Their Staples Center neighbors, the Clippers, also received votes, finishing just behind Toronto, the team that was able to eventually pry Leonard out of San Antonio. Where will Kevin Durant start the 2019-20 season? The two-time reigning Finals MVP has already taken a pair of discounted deals with the Warriors, so the biggest question regarding his free agency next summer might not be where he'll sign, but for how much he'll sign. The majority of our panel sees him staying with the Warriors, with the bright spotlight of Madison Square Garden as a potential lure. Where will Klay Thompson start the 2019-20 season? The Warriors' sharpshooter just re-upped with Chinese sneaker brand Anta, providing him with the kind of supplementary income that might not force him to chase a max contract in 2019 -- or Golden State could decide that Thompson is worth keeping around at the max, regardless of luxury tax concerns. Plus, Thompson will be supermax eligible next summer if he earns another All-NBA nod.